After a record-cold Thanksgiving, temperatures continued to plummet as heavy snowfall across the Midwest grounded or delayed over 6,000 flights, wreaking havoc on Americans’ holiday travel plans. The Sunday of Thanksgiving weekend is usually the busiest travel day of the year, as millions of Americans return home from visiting relatives. 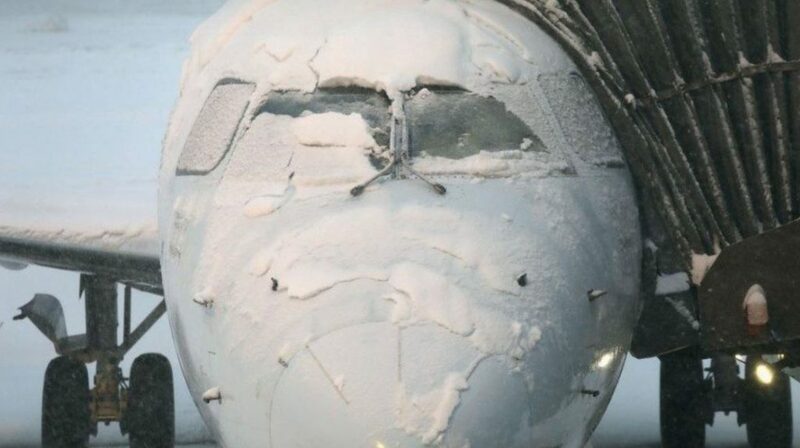 However, much of the country was snowed in this year, leading to over 1,200 flight cancellations and 5,000 delays, according to FlightAware.com. In the Midwest, blizzard-like conditions swept down from the Great Lakes, blanketing Michigan, Iowa, Indiana, Illinois, Missouri, Kansas, Wisconsin and Nebraska. Hundreds of flights were cancelled at Chicago’s O’Hare International Airport – the sixth-busiest airport in the world – while Kansas City International Airport shut down on Sunday afternoon as crews fought to clear the runway. Weather records were broken in multiple locations. Rockford, Illinois, received almost a foot of snowfall in what was the biggest one-day November snowstorm to ever hit the area. In Kansas City, Missouri, 5.3 inches of snow fell, breaking a 1923 record. With flights grounded, travellers choosing to go by road didn’t fare much better. In Kansas, large sections of Interstate 70 were shut down on Sunday evening, and Governor Jeff Colyer declared a state of emergency. Similar conditions saw parts of I-80 closed in Nebraska, as a storm reduced visibility to near-zero. Blizzard conditions trapped some motorists in their cars in Illinois. State police there warned stranded drivers to remain in their cars idling the engine until rescue teams could get through the snow to help. Authorities across the midwest have also warned that fallen trees may cause damage to power lines and transformers. The Northeast had been dealing with freezing temperatures since last week, and received heavy rain early over the weekend. Parts of New Jersey and New York received a month’s worth of rain on Saturday night, according to Accuweather.com, and more flooding is expected as the storm moves eastwards. Further north, upstate New York and New England can expect more than a foot of snow. Out West, blizzard conditions caused havoc in Colorado and Utah. Multiple injuries were reported in a 20-car pileup outside Frisco, Colorado on Saturday. Every year, around 54 million Americans travel over the Thanksgiving holiday. Many of them will now face the added headache of rescheduling grounded flights in an effort to get back to work this week. Six US airlines have offered to waive changing fees – which can often run higher than $200 – from affected airports. Weather anomalies are the new normal these days! Karma came back just like a boomerang for some people in China. A big advertisement sign fell down on to several people. 2 people got injuries including spinal injury. This U.S. Ecology is a private company, not a government facility. I am sure that this explosion was part of the cleaning up operation over Reptilian Military Secret Underground Base by Galactic Federation of Light. Look at Google Map. This site is located almost beside Mountain Home Air Force Base. US Air Force = Reptilian Air Force. Google Map of exploded U.S. Ecology site and Mountain Home Air Force Base side by side.